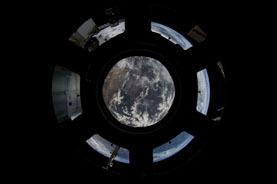 This video was taken by the crew of Expedition 38 on board the International Space Station. The sequence of shots was taken on January 30, 2014 from 13:34:12 to 13:38:48 GMT, on a pass over the Pacific Ocean, from just south of Alaska to west of California. This video primarily focuses on the glow of the Moon as the crew travels east into the sunrise. The glow on either side of the Moon as the video progresses is lens flare. 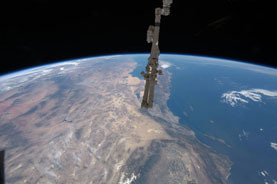 This video was taken by the crew of Expedition 38 on board the International Space Station. The sequence of shots was taken on January 30, 2014 from 13:07:04 to 13:31:39 GMT, on a pass from northeastern Malaysia to the North Pacific Ocean, just south of the Aleutian Islands. 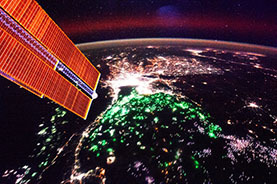 This video starts looking northeast toward Bangkok at night and continues to travel northeast toward Hong Kong, then continues toward the Korean Peninsula and Beijing area. 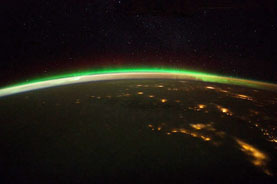 Just before the video passes over the black of the Pacific Ocean, the Kamchatka Peninsula can be faintly seen, with few city lights and snow-covered. The video ends looking north/northeast toward the Aleutian Islands. 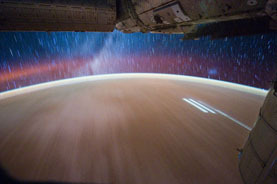 This video was taken by the crew of Expedition 30 on board the International Space Station. The sequence of shots was taken on February 8, 2012 from 10:31:38 to 10:35:25 GMT, on a pass over the North Pacific Ocean, from south of Alaska to just west of Vancouver. 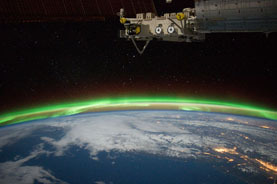 This video primarily focuses on the Aurora Borealis as the ISS travels southeast towards western Canada and the Coast Mountains. 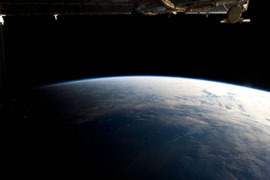 This video was taken by the crew of Expedition 31 on board the International Space Station. 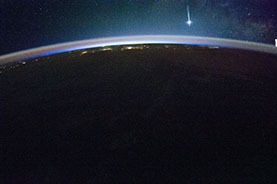 The sequence of shots was taken from May 6, 2012 from 06:28:09 to 06:41:08 GMT, on a pass from northeastern Kazakhstan to the North Pacific Ocean, east of Japan. This video features the ISS flying over northeastern Asia and over the Pacific Ocean. This pass begins over northeastern Kazakhstan, as the ISS begins traveling east and then southeast over the Baykal Lake in southeastern Russia, along with several smoke plumes from fires in the surrounding areas. The pass continues over cirrus clouds and possible smoke plumes before the ISS travels over northeastern China and ends over the North Pacific Ocean. 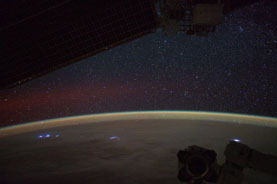 This video was taken by the crew of Expedition 31 on board the International Space Station. The sequence of shots was taken May 8, 2012 from 05:02:43 to 05:14:35 GMT, on a pass from South Pacific Ocean, near French Polynesia, to the North Pacific Ocean, west of Hawaii. 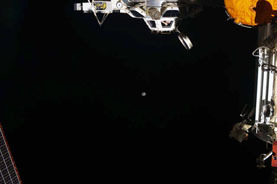 As this video begins, the ISS is passing over the terminator line into darkness. 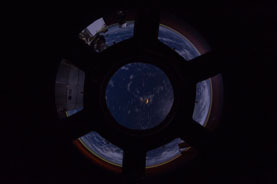 A crewmember inside of the Cupola then opens up the shades over the Cupola windows to observe the moon rising over the horizon. 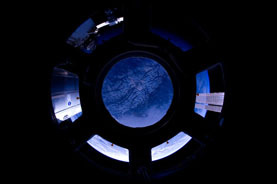 This video was taken by the crew of Expedition 30 on board the International Space Station. The sequence of shots was taken March 31, 2012 from 06:16:05 to 06:26:55 GMT, on a pass from just south of eastern Australia to the South Pacific Ocean. This video begins as the ISS travels over the Indian Ocean, east and then northeast to the Pacific Ocean. As the ISS travels to the east, the sun can be seen setting off in the west (away from the direction of travel). As the sun sets over the horizon, refraction from the Earth's atmosphere causes the sun to appear orange before setting behind the planet. 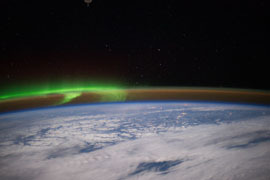 This video was taken by the crew of Expedition 30 on board the International Space Station. The sequence of shots was taken from February 25-26 at a variety of times, mainly over the Pacific Ocean. This video is comprised of 8 short videos where the astronauts left the shutter open for an extended period of time to capture the moving star field. This video consists of unique exposure techniques to display the star field and ground lights, and may therefore create a dizzying effect for the user. 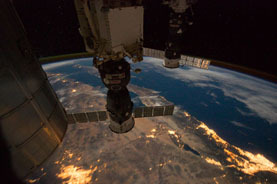 This video was taken by the crew of Expedition 30 on board the International Space Station. The sequence of shots was taken January 22, 2012 from 13:35:50 to 13:48:02 GMT, on a pass over the North Pacific Ocean, from west of Hawaii to just southwest of Vancouver. This video mainly involves the stars over the North Pacific Ocean as the ISS travels northeast towards southwestern Canada. The camera used to take this time-lapse sequence captures a great multitude of stars and constellations as looks west out of the Cupola. 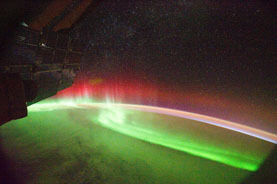 The pass ends near Vancouver, where the Aurora Borealis is seen. 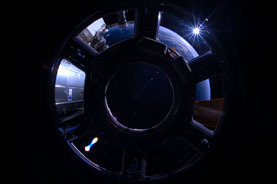 This video was taken by the crew of Expedition 30 on board the International Space Station. The sequence of shots was taken January 25, 2012 from 12:30:27 to 12:32:06 GMT, on a pass over the North Pacific Ocean, west of Oregon and Washington state. 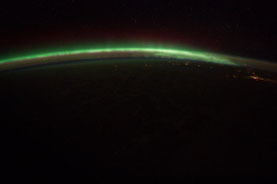 This short video focuses on the Aurora Borealis streaming across the North Pacific Ocean and over Canada. 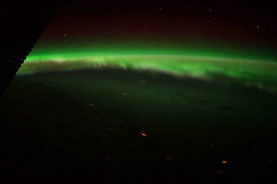 This video was taken by the crew of Expedition 30 on board the International Space Station. The sequence of shots was taken January 25, 2012 from 12:32:06 to 12:34:10 GMT, on a pass from the North Pacific Ocean to just southwest of Vancouver Island. 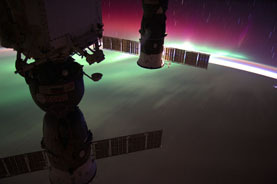 In this video, the International Space Station approaches the Aurora Borealis from the Pacific Ocean, where the auroras can be seen dancing very near the Station. 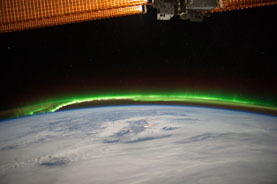 Video of the Aurora Australis taken by the crew of Expedition 29 on board the International Space Station. This sequence of shots was taken September 18, 2011 from 11:54:56 to 12:18:33 GMT, on an ascending pass from south of Australia in the Southern Pacific Ocean to the Northern Pacific Ocean, west of Central America. 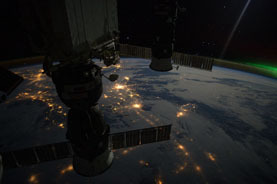 Moving lights can be seen several times throughout the video, and the most likely explanation is that these are satellites illuminated by the sun. The Milky Way can be clearly seen rotating slowly through the frames. The glow from the computer screens inside of the cabin is seen throughout the video near the solar panels.